Acetal protection of a ketone with ethylene glycol during reduction of an ester, vs. reduction to a diol when unprotected. A protecting group or protective group is introduced into a molecule by chemical modification of a functional group to obtain chemoselectivity in a subsequent chemical reaction. It plays an important role in multistep organic synthesis. In many preparations of delicate organic compounds, some specific parts of their molecules cannot survive the required reagents or chemical environments. Then, these parts, or groups, must be protected. For example, lithium aluminium hydride is a highly reactive but useful reagent capable of reducing esters to alcohols. It will always react with carbonyl groups, and this cannot be discouraged by any means. When a reduction of an ester is required in the presence of a carbonyl, the attack of the hydride on the carbonyl has to be prevented. For example, the carbonyl is converted into an acetal, which does not react with hydrides. The acetal is then called a protecting group for the carbonyl. After the step involving the hydride is complete, the acetal is removed (by reacting it with an aqueous acid), giving back the original carbonyl. This step is called deprotection. Protecting groups are more commonly used in small-scale laboratory work and initial development than in industrial production processes because their use adds additional steps and material costs to the process. However, the availability of a cheap chiral building block can overcome these additional costs (e.g. shikimic acid for oseltamivir). Protection of alcohol as tetrahydropyranyl ether followed by deprotection. Both steps require acid catalysts. Acetyl (Ac) – Removed by acid or base (see Acetoxy group). Benzoyl (Bz) – Removed by acid or base, more stable than Ac group. Benzyl (Bn) – Removed by hydrogenolysis. Bn group is widely used in sugar and nucleoside chemistry. β-Methoxyethoxymethyl ether (MEM) – Removed by acid. Dimethoxytrityl, [bis-(4-methoxyphenyl)phenylmethyl] (DMT) – Removed by weak acid. DMT group is widely used for protection of 5'-hydroxy group in nucleosides, particularly in oligonucleotide synthesis. Methoxymethyl ether (MOM) – Removed by acid. Methoxytrityl [(4-methoxyphenyl)diphenylmethyl] (MMT) – Removed by acid and hydrogenolysis. p-Methoxybenzyl ether (PMB) – Removed by acid, hydrogenolysis, or oxidation. Methylthiomethyl ether – Removed by acid. Pivaloyl (Piv) – Removed by acid, base or reductant agents. It is substantially more stable than other acyl protecting groups. Tetrahydropyranyl (THP) – Removed by acid. Tetrahydrofuran (THF) – Removed by acid. Trityl (triphenylmethyl, Tr) – Removed by acid and hydrogenolysis. Silyl ether (most popular ones include trimethylsilyl (TMS), tert-butyldimethylsilyl (TBDMS), tri-iso-propylsilyloxymethyl (TOM), and triisopropylsilyl (TIPS) ethers) – Removed by acid or fluoride ion. (such as NaF, TBAF (tetra-n-butylammonium fluoride, HF-Py, or HF-NEt3)). TBDMS and TOM groups are used for protection of 2'-hydroxy function in nucleosides, particularly in oligonucleotide synthesis. BOC glycine. The tert-butyloxycarbonyl group is marked blue. tert-Butyloxycarbonyl (BOC) group (common in solid phase peptide synthesis) – Removed by concentrated strong acid (such as HCl or CF3COOH), or by heating to >80 °C. Acetyl (Ac) group is common in oligonucleotide synthesis for protection of N4 in cytosine and N6 in adenine nucleic bases and is removed by treatment with a base, most often, with aqueous or gaseous ammonia or methylamine. Ac is too stable to be readily removed from aliphatic amides. Benzoyl (Bz) group is common in oligonucleotide synthesis for protection of N4 in cytosine and N6 in adenine nucleic bases and is removed by treatment with a base, most often with aqueous or gaseous ammonia or methylamine. Bz is too stable to be readily removed from aliphatic amides. Carbamate group – Removed by acid and mild heating. Acetals and Ketals – Removed by acid. Normally, the cleavage of acyclic acetals is easier than of cyclic acetals. Acylals – Removed by Lewis acids. Dithianes – Removed by metal salts or oxidizing agents. Methyl esters – Removed by acid or base. Benzyl esters – Removed by hydrogenolysis. tert-Butyl esters – Removed by acid, base and some reductants. Esters of 2,6-disubstituted phenols (e.g. 2,6-dimethylphenol, 2,6-diisopropylphenol, 2,6-di-tert-butylphenol) – Removed at room temperature by DBU-catalyzed methanolysis under high-pressure conditions. Silyl esters – Removed by acid, base and organometallic reagents. Orthoesters – Removed by mild aqueous acid to form ester, which is removed according to ester properties. 2-cyanoethyl – removed by mild base. The group is widely used in oligonucleotide synthesis. Methyl (Me) – removed by strong nucleophiles e.c. thiophenole/TEA. Silyl groups, especially in protection of the acetylene itself. Orthogonal protection of L-Tyrosine (Protecting groups are marked in blue, the amino acid is shown in black). (1) Fmoc-protected amino group, (2) benzyl ester protected carboxyl group and (3) tert-butyl ether protected phenolic hydroxyl group of Tyrosine. Orthogonal protection is a strategy allowing the deprotection of multiple protective groups one at a time each with a dedicated set of reaction conditions without affecting the other. In the example shown, the protected amino acid tyrosine, the benzyl ester can be removed by hydrogenolysis, the fluorenylmethylenoxy group (Fmoc) by bases (such as piperidine), and the phenolic tert-butyl ether cleaved with acids (e.g. with trifluoroacetic acid). A common example for this application, the Fmoc-peptide synthesis, in which peptides are grown in solution and on solid phase is very important. The protecting groups in solid-phase synthesis with regard to the reaction conditions such as reaction time, temperature and reagents can be standardized so that they are carried out by a machine, while yields of well over 99% can be achieved. Otherwise, the separation of the resulting mixture of reaction products is virtually impossible. Due to this effect the quantum yield for deprotection of the right-side ester group is reduced and it stays intact. Significantly by placing the deuterium atoms next to the left-side ester group or by changing the wavelength to 254 nm the other monoarene is obtained. Protected and unprotected syntheses of the marine alkaloid, hapalindole U.
Hideaki Muratake's 1990 synthesis using Tosyl protecting groups (shown in blue). Phil Baran's protecting-group free synthesis, reported in 2007. ^ Kamaya, Yasushi; T Higuchi (2006). "Metabolism of 3,4-dimethoxycinnamyl alcohol and derivatives by Coriolus versicolor". FEMS Microbiology Letters. 24 (2–3): 225–229. doi:10.1111/j.1574-6968.1984.tb01309.x. ^ Moussa, Ziad; D. Romo (2006). "Mild deprotection of primary N-(p-toluenesufonyl) amides with SmI2 following trifluoroacetylation". Synlett. 2006 (19): 3294–3298. doi:10.1055/s-2006-951530. ^ Romanski, J.; Nowak, P.; Kosinski, K.; Jurczak, J. (Sep 2012). "High-pressure transesterification of sterically hindered esters". Tetrahedron Lett. 53 (39): 5287–5289. doi:10.1016/j.tetlet.2012.07.094. ^ Clayden, Jonathan; Greeves, Nick; Warren, Stuart; Wothers, Peter (2000). Organic Chemistry. Oxford University Press. p. 1291. ISBN 978-0198503460. ^ Chan, Weng C.; White, Peter D. (2004). Fmoc Solid Phase Peptide Synthesis. Oxford University Press. ISBN 978-0-19-963724-9. 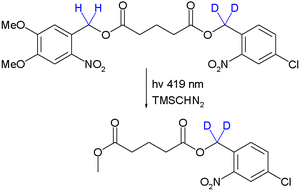 ^ Weng C. Chan, Peter D. White: Fmoc Solid Phase Peptide Synthesis, S. 10–12. ^ Merrifield, R. B.; Barany, G.; Cosand, W. L.; Engelhard, M.; Mojsov, S. (1977). "Proceedings of the 5th American Peptide Symposium". Biochemical Education. 7 (4): 93–94. doi:10.1016/0307-4412(79)90078-5. ^ Blanc, Aurélien; Bochet, Christian G. (2007). "Isotope Effects in Photochemistry: Application to Chromatic Orthogonality". Org. Lett. 9 (14): 2649–2651. doi:10.1021/ol070820h. PMID 17555322. ^ Baran, Phil S.; Maimone, Thomas J.; Richter, Jeremy M. (22 March 2007). "Total synthesis of marine natural products without using protecting groups". Nature. 446 (446): 404–408. Bibcode:2007Natur.446..404B. doi:10.1038/nature05569. PMID 17377577. Senior undergraduate study notes on this subject, from Prof. Rizzo. A further set of study notes in tutorial form, with guidance and comments, from Profs. Grossman and Cammers. A review by Prof. Kocienski. A user site excerpting the classic Greene and Wuts text regarding stability of a few key groups, from this reference's extensive tables.